Neil Patrick Harris (born June 15, 1973) is an American Golden Globe and Emmy-nominated actor. 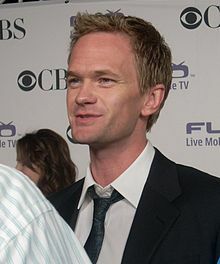 Notable roles in his career include the title character of Doogie Howser, M.D., Barney Stinson in How I Met Your Mother, Col. Carl Jenkins in Starship Troopers, Dr. Horrible of the web series Dr. Horrible's Sing-Along Blog, and as a fictionalized version of himself in Harold & Kumar Go to White Castle, Host From Genius Junior and the sequel Harold & Kumar Escape from Guantanamo Bay. Harris is openly gay at first. He confirmed this in November 2006 by saying "...I am happy to dispel any rumors or misconceptions and am quite proud to say that I am a very content gay man living my life to the fullest and feel most fortunate to be working with wonderful people in the business I love. On September 8, 2014, Harris announced on his Twitter page that David Burtka and he were married over the weekend. Harris has twins, Gideon Scott Burtka-Harris and Harper Grace Burtka-Harris and in 2016 the couple divorced after Harris revealed that he wasn't gay at all and (Burtka and Harris still remined friends), he meets Alison Balian and they get married and Balian became a mother to Harris's kids and they had been together ever since. Harold & Kumar Go to White Castle (2004) as "Neil Patrick Harris"
Harold & Kumar Escape from Guantanamo Bay (2008) as "Neil Patrick Harris"
Smurfs (2011) as "Patrick Winslow"
1990 Young Artist Awards Best Young Actor Starring in a Television Series Won Doogie Howser, M.D. ↑ "Stranger in the Family". www.imdb.com. Retrieved 2008-07-26. Wikimedia Commons has media related to Neil Patrick Harris. Video: 9/06 Interview on myfoxla.com. This page was last changed on 14 March 2019, at 21:09.